What Are the Ten Greatest Foods or Drinks Invented By Man? Hey Brits, What is Up with Your Olympic Mascots?? Would Larry Bird be a starter for these Celtics? Guy wins marathon wearing Vibram FiveFingers! David Mack, Former US All-Time #3 At 800, Oregon Star, Gets Out Of Prison Mack, a former LAPD officer, was part of the Rampart scandal. He went to jail for bank robbery but was a suspect along with fellow Oregon teammate Amir Mohammed in the murder of Notorious BIG. We hope Mack turns his life around but reports are he became an avowed member of the Crips gang while in prison. LetsRun.com's Week That Was Last week was an epic week. The BCS power conferences had their conference meets, the Diamond League got under way in impressive fashion, Tyson Gay ran 19.41, Charlie Francis passed away, and there were a ton of high quality road races. We try to recap it all for you. Along the way, we announce the return of Nancy Langat and give out special praise to AJ Acosta for an amazing performance at PAC-10s and famed coach Renato Canova for ripping the idiots on the LRC message boards. Another College Runner Photographed After Being Pelted Severely With Hail Says a truck passing by may have saved his life after a hail storm made his long run an absolute horror. Angela Bizzarri's 0.01 Win In 1,500 Combined With 5k Win Adds To Legacy Illinois senior Bizzarri is the ultimate clutch and team performer. PAC-10 TV Schedule Fox Sports and other channels are replaying some events from the PAC-10 champs over the next week or so. *Ken Goe PAC-10 Recaps Nicole Blood, Chris Derrick win 5k/10k double. Ashton Eaton wins decathlon, 110 Hurdles, LJ, 2nd in 100, runs leg on 4 x 1 ... Acosta scores in 1,500 (3:41), steeple (8:52), 5k (13:46) to give Ducks close win over USC. Boards: *AJ Acosta - 13:46.87 - 3rd place in 5,000 !!! 19 Points at Pac Tens!!! WHAT A STUD!!! Big 12 Lisa Koll 15:22! Nebraska 1st, Oklahoma 2nd, US #1 Texas A&M men 3rd. No problem for A&M women, who win handily. Big 10 *Final Results Big Ten Nailbiters! Gophers Grab Men's, PSU Lady Lions Take Women's Big Ten Titles. Minnesota had 3 scorers run 1:49 in 800, Angela Bizzarri wins 1,500 by 0.01 and 5,000 in 16:12, Wisco men 1-2 in 1,500, Franek scores 10, 5, 6 in Steeple, 1,500, 5k. IC4A A first: GMU frosh Chris Carrington runs 1:48.96 and misses the final thanks to strong 800 prelims. Tommie Smith Thinks Gay Can Beat Bolt At 100m Gay almost ran as fast for the first 150m of the 200m as Bolt did last year when he set a straight 150m WR. *Boards: Did Gay really run 8.72 from 50m-150m?? Full Recap Of Manchester City Games We love the execution of this meet and hope they listen to 200m winner Allyson Felix and bring the event to NYC or L.A. (except nobody would go if it was in L.A.). Tyson Gay 19.41 200 Tommie Smith (former straight 200m WR holder) was on hand to congratulate Tyson Gay, who ran 9.88 for the first 100 and 8.72 from 50-150m on the straight track. 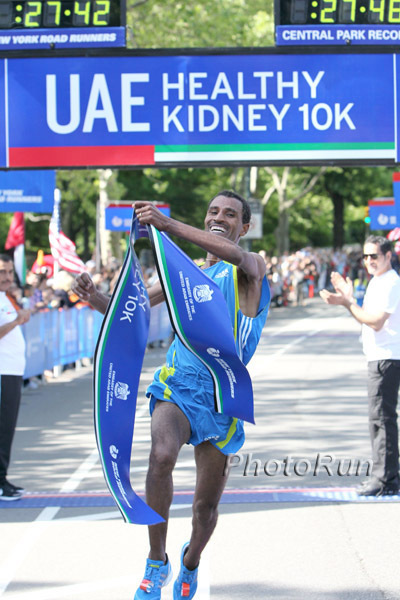 Haile Struggles But Wins BUPA Manchester 10k Haile's previous bests at Manchester were 27:25 (2005) and 27:39 (2009). Worknesh Kidane (2003 World XC champ) won the women's race and is the wife of Healthy Kidney and Central Park record setter (and World XC champ) Gebre Gebremariam. *Amateur Reporter Gives Interesting Insight Into Healthy Kidney Runners Kamais, Birmingham and Co. 2nd-place Kamais is a Kenyan who trains himself, Birmingham's shoeless 1,200 at Penn set him back 1 week. Running Times Interviews Lukas Verzbicas After demolishing the competition at the '09 Foot Lockers, Lithuanian-born Verzbicas cemented himself as the best HS distance runner in the US. Only a sophomore, Verzbicas may focus on the triathlon for a few years to try to make the US 2012 Olympic Team. *Speaking Of 2012: Photos Of Kid-Chosen London Olympic Mascots The mascots are friendship bracelet-wearing cyclops with London taxi lights on their heads. *Full Results Jamaican Kenia Sinclair (2:00) got a nice win, beating Pamela Jelimo (2:01), Steve Slattery showed he is back in great shape with an 8:24 steeple, world champion Mbulaeni Mulaudzi got an easy win in the 800 in 1:45.6. USA's David Oliver (13.11) crushed WR hlder Dayron Robles and reigning world champ Ryan Brathwaite in the high hurdles. *South Korea Use Bolt/Daegu As World's First Live Stereoscopic 3D TV Broadcast South Korean TV watchers became the first nation to see a live sporting event in stereoscopic 3D. Boards: "Are we going to see the most unbelievable year for sprinting in the history of the sport?" Recommended Read: Funeral For A Friend - Jim Ferstle Recalls Charlie Francis Ferstle describes the pinnacle of the sprinting world: "Contrary to popular belief, not everyone was seeking an 'edge' from doping, many just wanted it to be a 'fair fight' where each side came into the battle with similar tools." *Times Says Athletes May Protest Return Of Caster Semenya We think the headline is potentially misleading, as the quotes come from many months ago. *Kenyan Organizers Hustling To Get Ready For African Champs In 5 Weeks They're just now laying asphalt for a warmup track. Recommended Read: World-Leading Sports Scientist Tim Noakes Speaks Out In Defense Of Semenya, ASA If anyone has an educated, unbiased grip on the Caster Semenya situation, it's Tim Noakes, the South African-based co-founder of the IOC's Olympic Science Academy and of the Sports Science Institute in Cape Town. In no uncertain terms, Noakes explains why he believes unequivocally that Caster should be allowed to run and the case is more about protecting image rather than a reality. Recommended: Mike Hurst - A Personal Perspective On Coach Charlie Francis A great read from a friend of Francis titled "End of good run for flawed coach." Short Piece On Marathon WR Setter Derek Clayton This short bio was sent to us by a reader. It's amazing to look back 40, 50 years to see what guys were doing in that era. Chepkurui Sets Another World 12k Record At SF's Wild Bay To Breakers Lineth Chepkurui is having a road racing season to remember: 30:45 10k Crescent City, 51:51 Cherry Blossom 10-mile, 38:10 WR Lilac Bloomsday 12k, 38:07 WR Bay To Breakers 12k. Sammy Kitwara got a very narrow win in a much slower men's race (yes, that is an avatar in the photo above). Princess: Watch Sanya Richards-Ross $600,000 Wedding On WEtv Mon Late Nite You knew "Track On TV" was a hoax. Pauper: IAAF's Lamine Diack Announces Plan For Million$ In Cuts Some are calling for Diack to give up the leadership role of the supposedly imperiled IAAF. Benchwarmer Marion Jones Packs Tulsa Arena Tulsa Shock fans were out in droves for their team's season opener with disgraced track and field phenom Marion Jones. Jones barely got off the bench and only scratched the scorecard with one personal foul. Coach: Marion Jones' Teammates So Nervous They Were Airballing Layups Don't expect this headline on the next WNBA commercial. LRC Photos Tell Story Of Doha Diamond League Opener Who has time to look up every result? See our photos and find out who won every event in Doha. 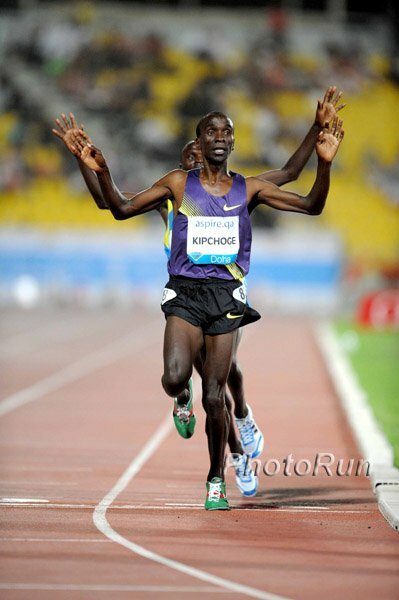 *Joseph Ebuya is not very good We don't care what he ran in Doha. He's the World XC champ. We're surprised he ran the race, but wish Universal Sports had even acknowledged him being on the starting line.